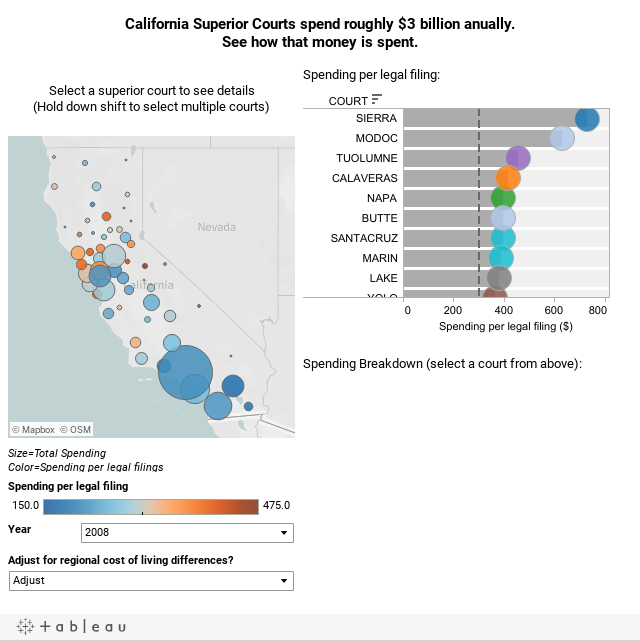 The California judicial branch is facing $350 million in cuts. That’s a nine percent cut to the judiciary’s $3.9 billion budget for the coming year. So, facing the axe, it might be nice to know where the courts are spending money inefficiently and to root out those practices so that the cuts don’t horribly degrade quality of service. Shockingly, before today there was no systematic way of doing this. So, California, before you swing the axe, please look at this visualization to better guide its path. Not bad but slightly simplistic, all courts have fixed and variable expenses. The analysis looks at all costs on the basis of a single variable (filings). Second all filings are not comparable in complexity. Sierra appears to be a very small court - one complicated filling could easily cause the average to high. Also this is a single year look at spending per filing, a multi-year analysis would help determine if there is a pattern or not.